Aurora Feint Forum Review by cjvitek (For more Forum Reviews, see the TiPb iPhone App Store Forum! This is an extremely interesting game that tries to combine elements of a puzzle game with elements of an RPG game. You start with a map screen. From there, you can go to the mine (the puzzle game), the store (to use your tiles for skills or tools), the smith (to actually obtain the tools), and the tower (to actually learn the skills). You need to start with the puzzle game, and once you start to gain levels and tile,s you can move to the other areas. As a puzzle game, it is a pretty standard "match multiple tiles" type of game. You move peices horizontally to try to match at least three tiles together. One twist is that by holding your iPhone at different angles, "horizontally" changes, so in reality you can also move tiles vertically. Depending on the orientation, "gravity" is always down, so the tiles may fall differently as well. The graphics are pretty nice (there are five types of tiles) and the sound during the game is nice as well. There are a few powerups (more on this later) that add to the game play, destorying additional tiles or various other effects. As you destroy tiles (or "resources", consisting of water, fire, earth, moon, and wind), you are actually "collecting" them, and this is used in the RPG side of the game. As you complete levels of the game, you gain experience, and can choose to "level up" in various areas. These additional levels allow you to either learn new skills, or gain new tools. This is all based on the number of tiles you have collected. To learn a skill or gain a tool requires various combinations of the five tiles - if you don't have enough of a specific type that you have collected, you can't learn the skill or gain the tool. Learning skills or gaining tools requires you to complete a different puzzle. For skills, you are required to solve a specific puzzle (matching similar globes this time, making them all vanish) in a limited amount of moves. As the skill levels progress, these puzzles become harder. 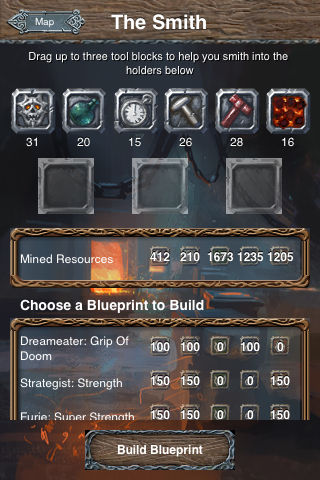 To learn new tools (by building blueprints), you have a time limited tile-removal puzzle, where you have to collect a specific number of tiles in various combinations (these are different from the tiles that are collected to try to gain the tool). If you fail at these puzzles, you have to try again at a later date. All said, this is a complex game with an intriguing concept - combining a puzzle and RPG game. However, there are some problems that I have had. There are some features of the game that I can't figure out. There seem to be scrolls you can buy, but I haven't found out how to di that. In addition, it appears like you can have multiple members in you "party", but I can only really get one player going. My biggest problem is with the RPG aspect of the game, however. The first problem is that many of the skills and tools are confusing. Once you get a tool, it can appear during the puzle side of the game (the power ups I mentioned previously). It also appears that you are supposed to be able ot "merge" tools, or use them when you are building blueprints, but I can't figure that aspect of the game out as well. This all dovetails into my biggest issue - the lack of clear instructions. There is no help screen or anything the clearly describes the gameplay, the features, or the RPG side of the game. With a game this complex, I think some sort of help screen is essential. The last problem I had was with the RPG side of the game. Allowing a player to "level up" and learn different skills is great, but it doesn't appear that there is any real specialization going on. That is, if you don't learn a skill or a tool at one point, you can try to do so at the next "level up". Rather than allow people to really choose a path for their characters, it just appears that you can only choose the order in which you gain new skills and abilities - but eventually all character would be the same. I applaud this game and the developers for trying a new approach to a puzzle game. And I think it has a lot of potential. Heck, even with the game as it currently stand I probably play it more than almost any other game. But it seems like they took a great concept, and stopped 10 yards short of the goal line. A little more development could have made this an incredible game, instead of a merely "very good" game. It is free, so I strongly recommend trying it. As I said, even with my concerns and issues, it is one of my top three games on my iPhone.